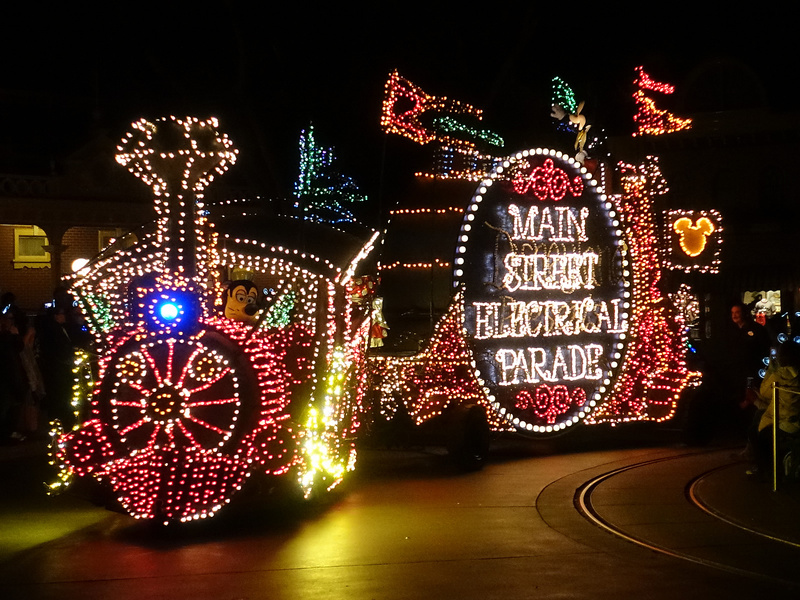 The Main Street Electrical Parade has returned to Disneyland for a Limited Engagement through June 18, 2017. Photo by Adrienne Vincent-Phoenix. 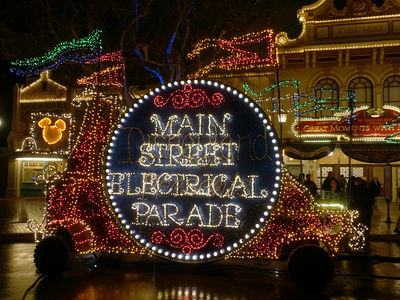 After a 20-year "hiatus" during which parts of the parade made trips to Paris, Florida, to Disney California Adventure and then back to Florida again, the Main Street Electrical Parade has finally returned to Main Street, U.S.A. Thousands of fans gathered inside Disneyland last Thursday night and crossed their fingers that the rain would stay away during a special after-hours preview event. Thankfully the weather cooperated, and MSEP fans of all ages watched as the newly restored drum unit led the procession through Disneyland once more. 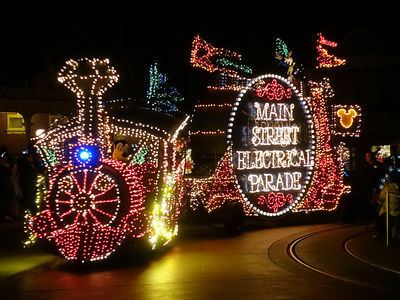 Goofy drives the train as Mickey and Minnie wave from the restored title drum unit of the Main Street Electrical Parade. Photo by Adrienne Vincent-Phoenix. The bespectalced turtle spins its way down Main Street, U.S.A. during the premier performance. Photo by Adrienne Vincent-Phoenix. The colorful insects of the Alice in Wonderland unit are always a favorite part of the Electrical Parade. Photo by Adrienne Vincent-Phoenix. 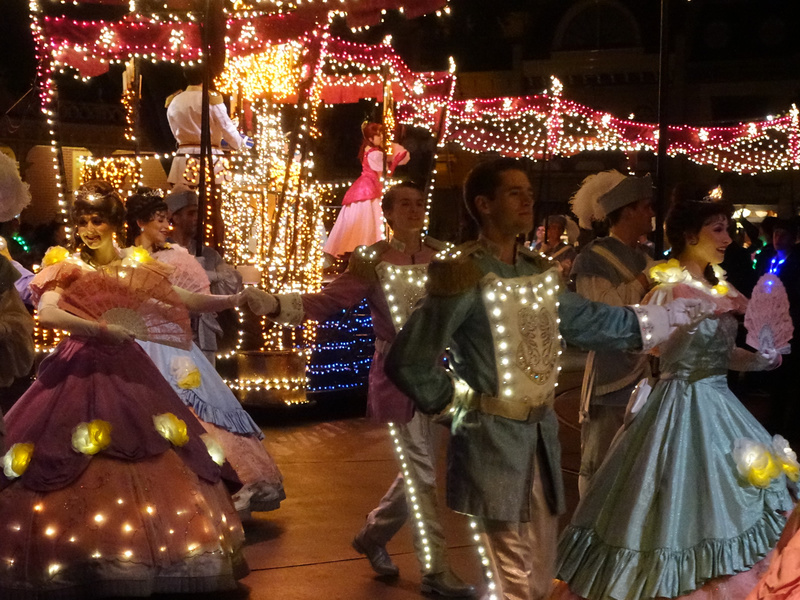 Performers dance under a lit canopy during the Main Street Electrical Parade. Photo by Adrienne Vincent-Phoenix. The parade looks much like it did when last we saw it across the esplanade at Disney California Adventure, though there have been a few changes. 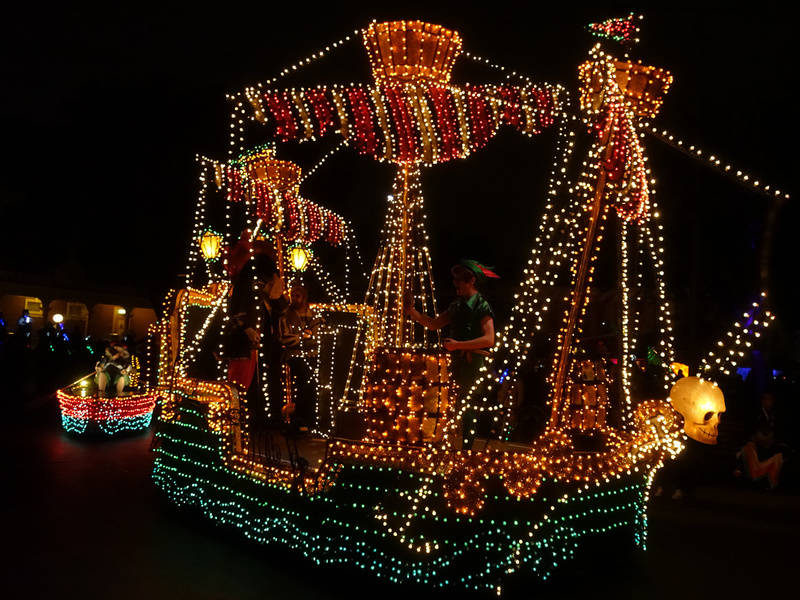 Tinker Bell's hot air balloon no longer leads the parade, and in fact is missing from her unit entirely. Tink now stands on her float, which follows the Peter Pan characters down the route. 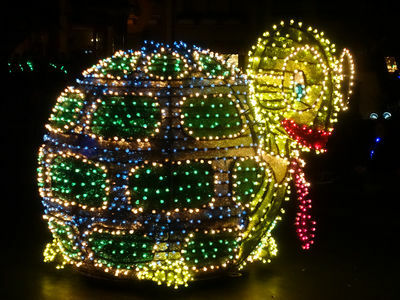 However, the "Pixie dusted" LED additions made to the MSEP floats back in 2009 are still in use. Captain Hook and Peter Pan do battle in the middle of the parade route. Photo by Adrienne Vincent-Phoenix. Mr. Smee rows to catch up with Captain Hook's ship. Photo by Adrienne Vincent-Phoenix. 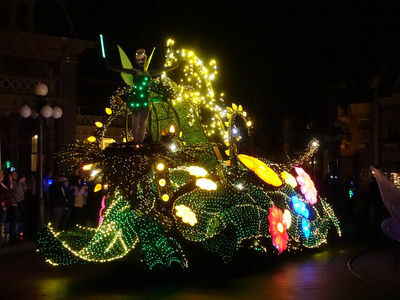 Tinker Bell stands at the front of her float. Photo by Adrienne Vincent-Phoenix. The parade is scheduled for two performances most Friday through Sunday nights, and one performance most Monday through Thursday nights. The performance schedule will change during holiday weekends and Spring break. The parade is not performed during rain, which has not been a consideration over the past several years dues to California's historic drought, but has suddenly become quite a concern due to record-breaking winter storms. 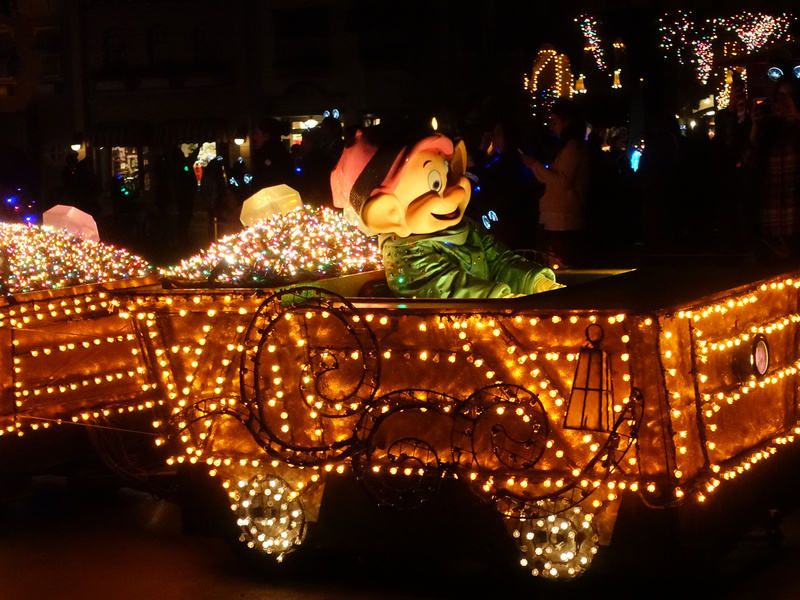 Dopey drives the mine train down the parade route during the return of the Main Street Electrical Parade to Disneyland. Photo by Adrienne Vincent-Phoenix. Always a crowd favorite, Eliott still disappears on command from his rider, Pete. Photo by Adrienne Vincent-Phoenix. The parade ends with the To Honor America flag and eagle unit. Photo by Adrienne Vincent-Phoenix. 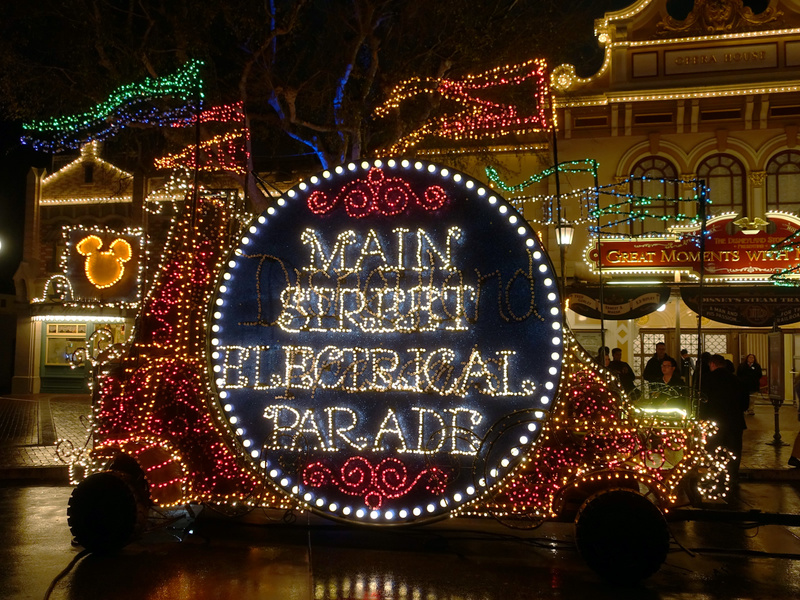 Several Disneyland quick-serve restaurants are offering "secret" menus as part of the Main Street Electrical Parade promotion. Signs advertising these special menu items were posted at the locations during the MSEP Premiere event Thursday night, but according to the chef behind the secret menu initiative, will not be displayed during normal park hours. (MousePlanet readers have since reported seeing the signs in some—but not all—of the locations). The idea is that these menu items are for those "in the know," and the chef is relying on social media to spread the word. You may spot signs like this at restaurants around Disneyland, but if not, we have the details you need about the secret Main Street Electrical Parade menu. Photo by Adrienne Vincent-Phoenix. All of these will be available through the MSEP "Limited Engagement," so you have some time to sample them all. 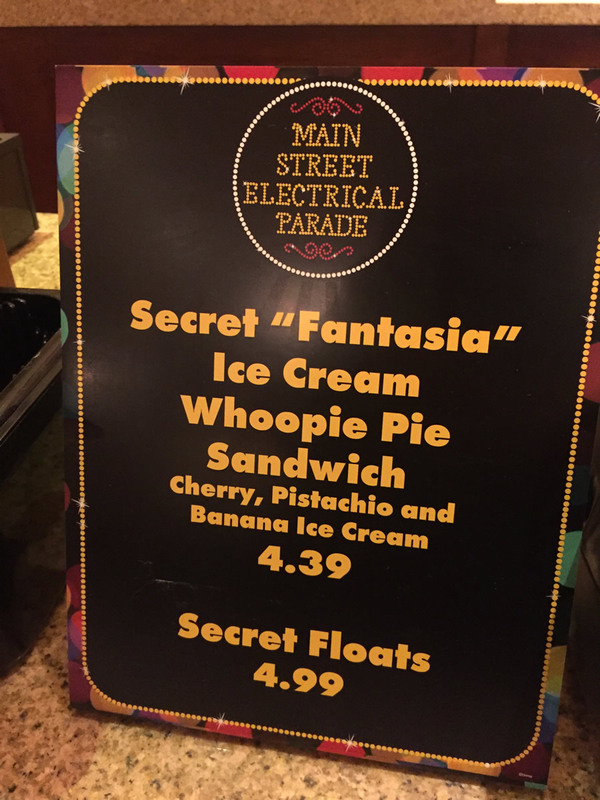 And yes, you read that correctly, Fantasia ice cream IS BACK for the duration of the Main Street Electrical Parade promotion. Disney would not say where they are having the ice cream made, but confirmed that a local supplier is making the ice cream from a new recipe that is intended to pay tribute to—not replicate—the original banana, cherry and pistachio confection created exclusively for Disneyland. 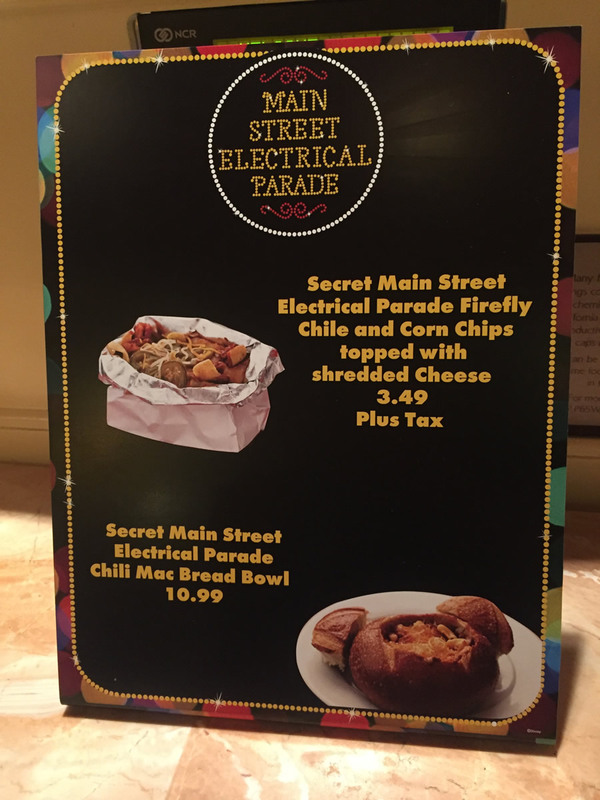 The Secret Firefly chili and corn chips is a surprisingly generous portion for $3.49, and is a perfect portable snack for a chilly wait along the parade route. Photo by Adrienne Vincent-Phoenix. Disney California Adventure has kicked off the 2017 Lunar New Year festival with two new entertainment offerings and an expanded selection of food from Korea, China, and Vietnam. 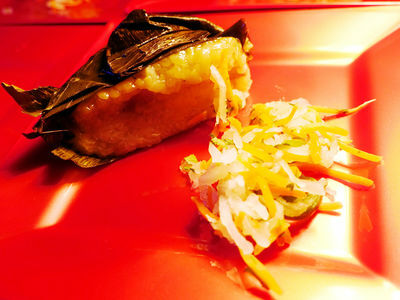 Three of the marketplace booths from the Food and Wine festival have been brought out for this event, and the Paradise Garden Grill menu has converted to a Lunar New Year menu for the duration. A fried whole tilapia is one of the new menu items offered during the Lunar New Year celebration. Photo by Adrienne Vincent-Phoenix. I was pleasantly surprised to see that Disney chefs really pushed the traditional theme park envelope with these offerings. 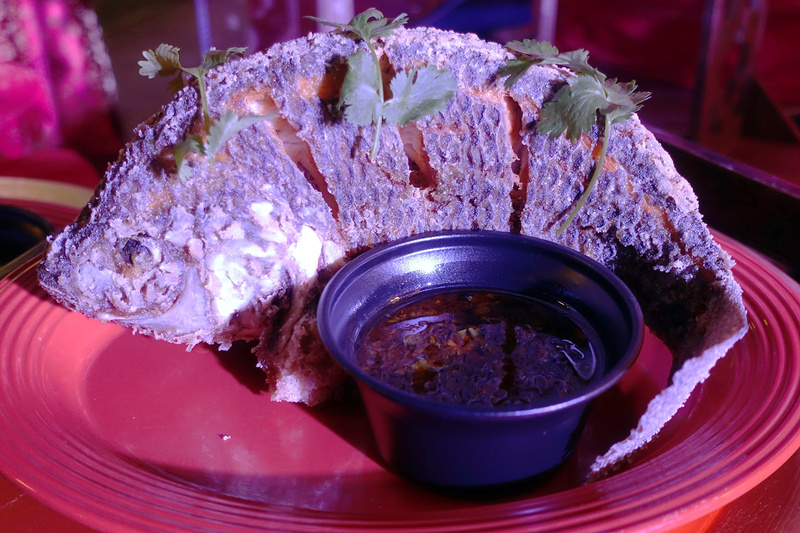 It's hard to believe a counter-service restaurant in a Disney theme park selling a fried whole fish, but there it is on the Paradise Garden Grill menu. The fish is served family style with rice, soup, and sauteed greens for $25. As with the Food & Wine Festival, the prices at the marketplace booths are $1 or $2 higher than seems reasonable for the portion size, though the menu at the Paradise Garden Grill is a better value. Sticky rice with pork is one of dishes available during the Lunar New Year festival at Disney California Adventure. Photo by Adrienne Vincent-Phoenix. 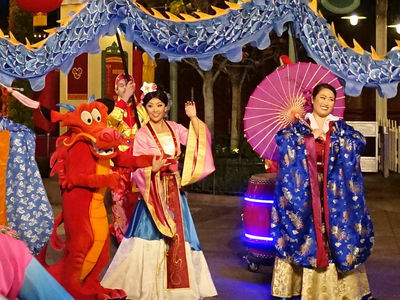 Another addition to the Lunar New Year celebration is Mulan's Lunar New Year Procession, a colorful performance held in Paradise Pier. Mulan and Mushu preside over this processional, which features dancers, acrobats and drummers. 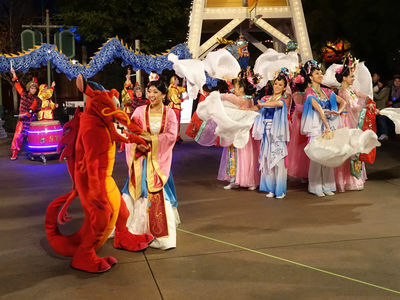 Mulan and Mushu have appeared in a mini-parade during past Lunar New Year celebrations, but this is a much more involved affair with a larger cast than in past years. Without ready access to the sound track I'm having to rely on a decades-old memory here, but this processional sounds like it is set to the same musical arrangements as Disneyland's long-departed Mulan parade. 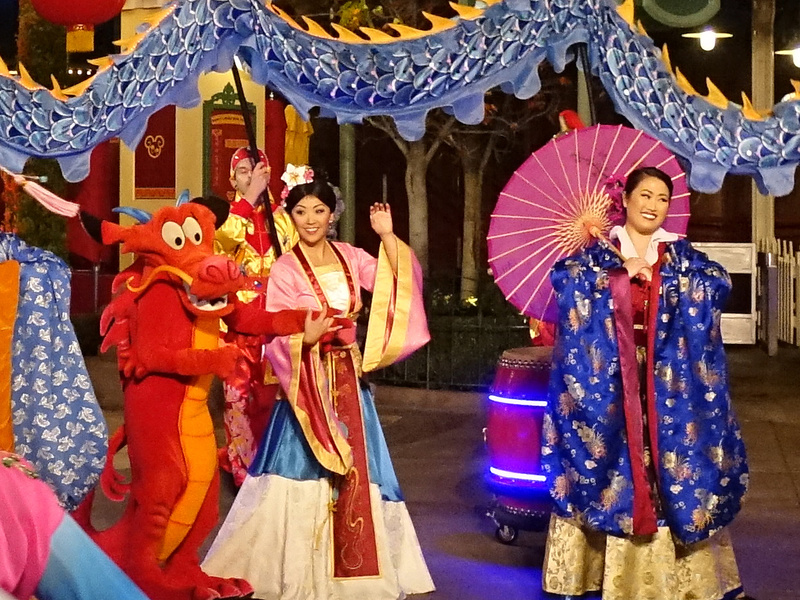 Mushu and Mulan star in Mulan's Lunar New Year Procession at Disney California Adventure. Photo by Adrienne Vincent-Phoenix. 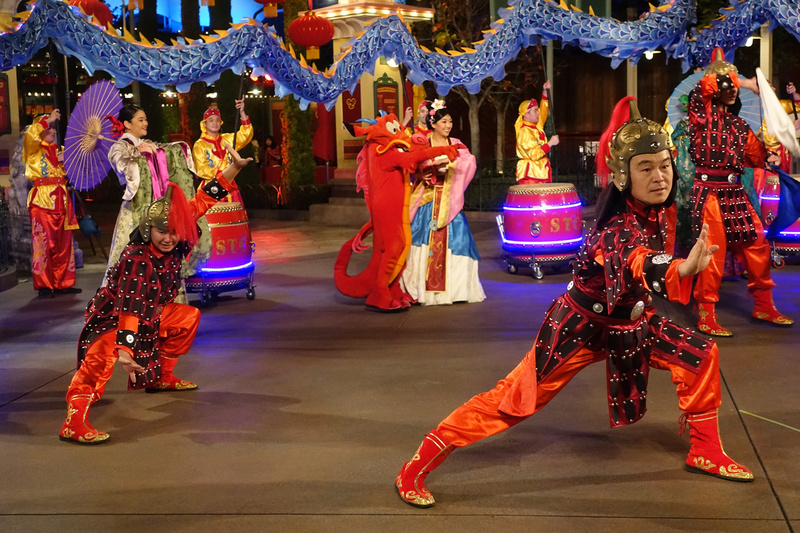 Mulan's Lunar New Year Procession features dancers, drummers and acrobats. Photo by Adrienne Vincent-Phoenix. Like the Viva Navidad street party, there is a fairly small viewing area available here, so you'll want to make sure to arrive early enough to stake out a good spot. Check performance times on the Disneyland website before you go, or check the Times Guide or Disneyland app once you're in the park. The procession is scheduled to run through February 5, 2017. If you don't think you'll make it to DCA to see it in person, you can re watch our live stream of the premiere performance from our Periscope channel. 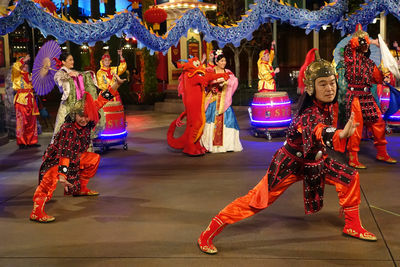 Acrobats perform during Mulan's Lunar New Year Celebration. Photo by Adrienne Vincent-Phoenix. 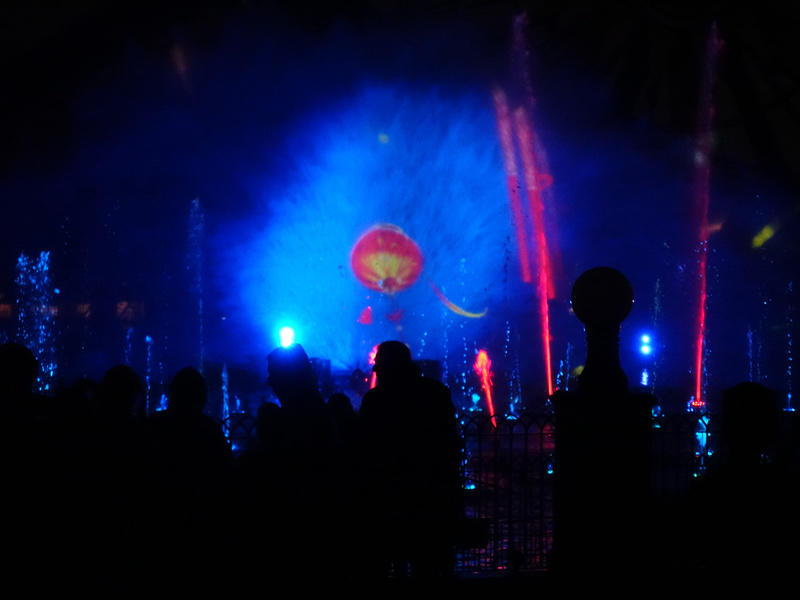 The new World of Color preshow tells the story of a little lantern trying to get home in time for the Lunar New Year celebration. Photo by Adrienne Vincent-Phoenix. Disney's celebration of the Year of the Rooster includes a brand new pre-show for the World of Color show. Hurry Home – Lunar New Year Celebration is an eight-minute mini-show, presented before the start of each performance of the World of Color. You can rewatch our live stream of the premiere performance from our Periscope channel. Disney California Adventure celebrates the Year of the Rooster with a Lunar New Year addition to the World of Color. Photo by Adrienne Vincent-Phoenix. ...Annual passholders can purchase a new refillable popcorn bucket at Disneyland and Disney California Adventure now through March 19. The buckets are $15 each, and refills are $1 each, plus tax. Get all the details on our MousePad discussion forum. 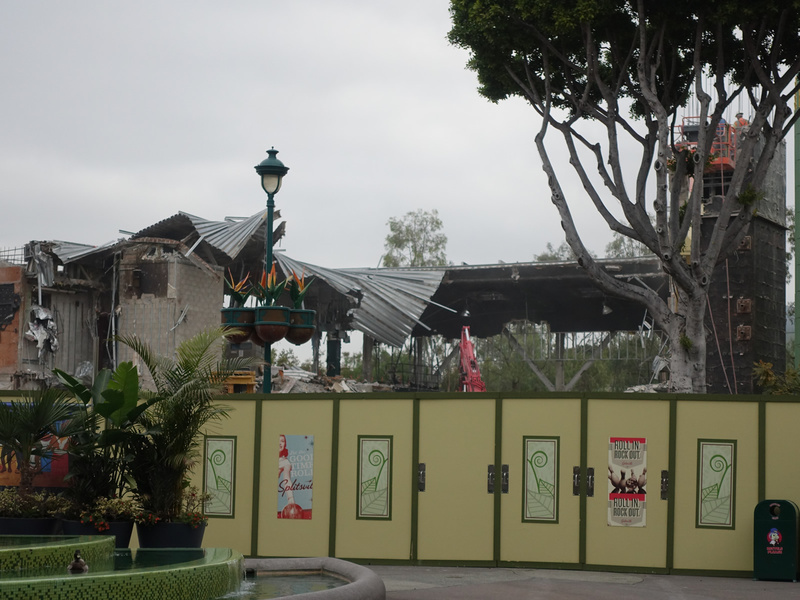 The House of Blues building is almost completely demolished in Downtown Disney, making way for construction work to begin on the new Splitsville Luxury Lanes. Photo by Adrienne Vincent-Phoenix. ...The Disneyland Resort is holding auditions all this week for parade performers. Based on the casting call for "Acrobat High Bar Performers" and for acrobats with experience on jumping stilts, it appears the resort is casting for the return of the Pixar Play Parade, the only current parade to feature such acrobats. The Pixar Play Parade ended its run last year with no official word from Disney as to whether the parade would return in 2017. The official @DisneyAuditions Twitter account on Sunday night also posted an audition for female parade performers, using a photo taken from Mickey's Soundsational Parade at Disneyland. There is nothing in the audition listing that specifically indicates that the casting is for the Soundsational Parade, and there is no audition posted for the drum line which leads the parade. It's possible that whomever manages the account just used a stock photo. 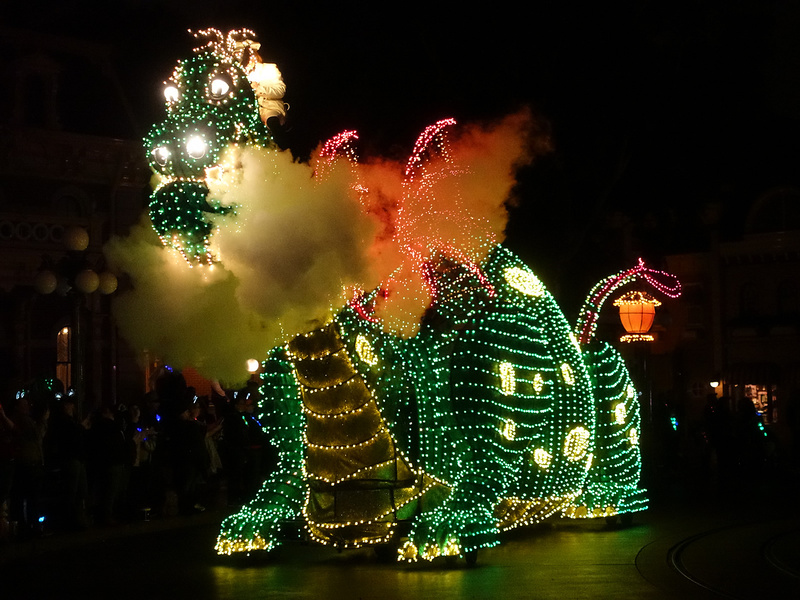 Disney has said only that Mickey's Soundsational Parade would return in early 2017, but as of this writing the parade is not on the entertainment calendar. 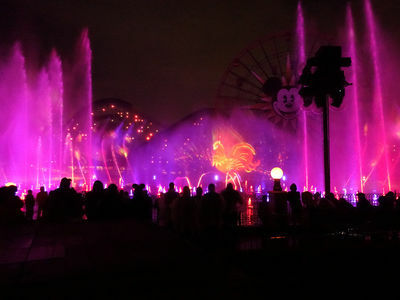 ..The Anaheim fire department responded to two calls Sunday night at the Disneyland Resort. One was a reported fire at Big Thunder Mountain Railroad in Disneyland, and the second a reported fire at the Little Mermaid attraction in Disney California Adventure. There has been no update as to the extent, if any, of damage to the attractions. Both Disneyland and Disney California Adventure closed early Sunday night due to rain. ...This coming weekend, January 28–29, is what we call "Use it or lose it" weekend at the Disneyland Resort. This final weekend in January marks the deadline for cast members, community groups and Club 33 members to use their remaining complementary admission tickets from their 2016 allocation. …The MousePlanet Newsletter is here! 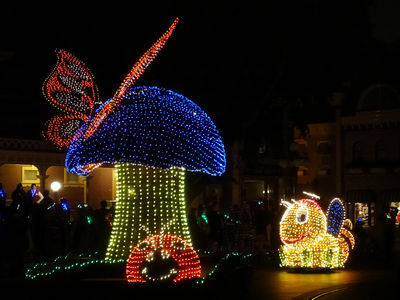 The newsletter contains a recap of the week's articles (in case you miss a day), news that may have developed since the weekly Updates were published, and tips about what's happening at the Disney theme parks for the coming weekend. We'll also include a fun bonus, such as an Eye Spy or a trivia question. To subscribe to our free newsletter, just enter your e-mail in the box below. Save time and money at Disneyland. TouringPlans.com can help you avoid falling into the typical tourist pitfalls with our per-park Crowd Calendar, Lines App with access to current and estimated wait times, and Touring Plans detailing the best plan of attack for hitting the attractions. Our trip planning tools show you the least crowded park to visit every day, customized touring plans for visiting Disney’s best rides, honest restaurant reviews, how to save on Disney tickets, and so much more. Disneyland crowds for the next 365 days. Note: Not all attraction closures have been officially confirmed by Disney, and are all subject to change at any time. Refurbishment schedules are estimates only. We recommend checking for updates as you plan your visit. All information is subject to change without notice. To get the most recent updates, visit Disneyland.com—this information is no longer available from the automated phone service. Pioneer Mercantile – closed for refurbishment. Reopening date not yet published, but after February 5. 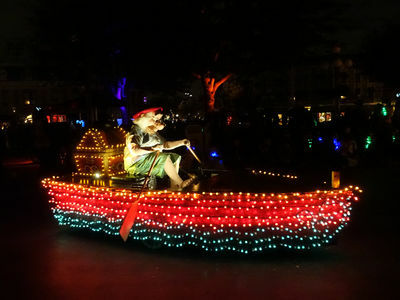 Jingle Cruise – closed through February 2 for removal of the holiday overlay. "it's a small world" – closed January 22 – February 2 for removal of the holiday overlay. Pirates of the Caribbean – closed for refurbishment February 3 – March 15. Muppet*Vision 3D – closed indefinitely. The theater has been renamed the Sunset Showcase Theater, and will likely be used for movie previews until a permanent replacement is found. The Twilight Zone Tower of Terror – closed for transformation into a new Guardians of the Galaxy attraction. Grizzly River Run – closed through February 14 for refurbishment. Redwood Creek Challenge Trail – closed through February 23 for annual refurbishment and ropes replacement. House of Blues Anaheim – closed. The 23,000-square-foot restaurant and concert venue will be partly demolished and converted into a new Splitsville Lanes, scheduled to open in late 2017. Grand Californian Hotel Pools – Closed through spring 2017, All three of the pools at the hotel will be closed for refurbishment, including the Redwood Pool and water slide, the Fountain Pool, and the Mariposa Pool. The cabanas will also close during this time. The closure is not currently listed on the hotel's website. During the refurbishment, which is expected to last at least through March, people staying at the Grand Californian Hotel can use the pool facilities at the Disneyland Hotel or Paradise Pier Hotel. Check here to see if a large convention, competition, or park event might fall during your next trip to the Disneyland Resort. If you know of any in-park events, official or unofficial, that should be listed here, please send us an e-mail (link). "Use it or lose it" weekend – January 28–29. Our designation for the final weekend of January, which marks the deadline for cast members, community groups, and Club 33 members to use their remaining complementary admission tickets from the 2016 allocation. Disney California Adventure Food & Wine Festival – March 10 through April 16. Tickets for the premium events go on sale February 1. Dapper Day Spring Outing to Disneyland (unofficial event) – Sunday, April 23. More information at the event website. This popular event grows larger each year, so it's worth making note of the date if you plan to visit the park during this weekend. 2017 Grad Nites: May 5, 6, 10, 17, 19, 20, 24, 30 and 31; June 2, 3, 6, 7, 9, 10, 14, 16 and 17. 2017 Tinker Bell Half Marathon Weekend – May 11–14. D23 Expo – July 14–16, 2017. Tickets are now on sale through the official D23 website. 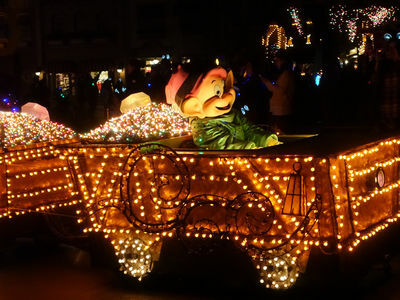 Dapper Day Fall Outing to Disneyland (unofficial event) – Sunday, November 5. More information at the event website. This popular event grows larger each year, so it's worth making note of the date if you plan to visit the park during this weekend. Notable events at parks and attractions around Southern California. If you know of an event that should be listed here, please send us an e-mail (link). Red, White and Boom – July 4. Lunar New Year – January 28 – February 21.
Notable school holidays that may impact park attendance. If you know of any other holidays that should be listed here, please send us an e-mail (link). Cesar Chavez Day – Friday, March 31. Many locals schools are closed. Disneyland prices as of February 28, 2016. No discounts currently available to the general public. Check with your employer, school or credit union to see if any discounts are available through them. 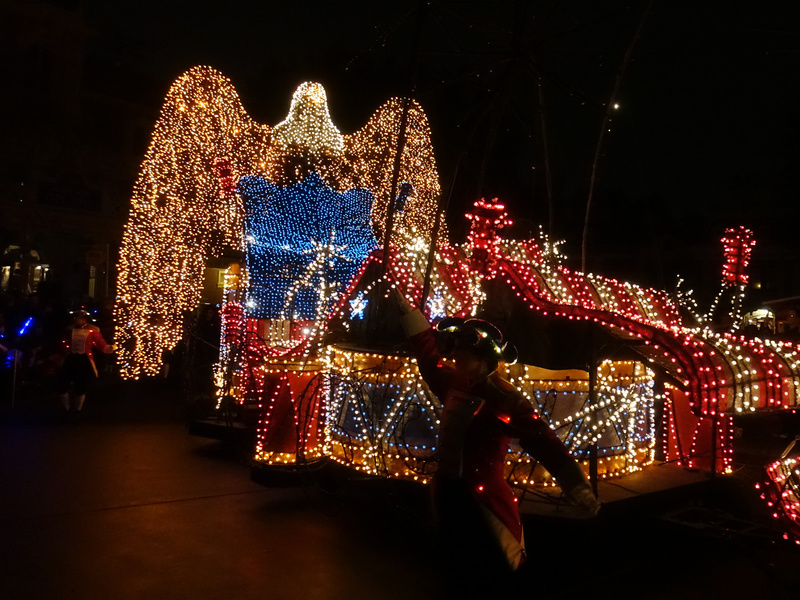 Disney released details of its 2017 Military Salute offer for Disneyland and Walt Disney World last October, and the tickets are valid January 1 through April 8 and April 24 through December 19, 2017. At the time we first shared details of the offer, we did not know about (or Disney had not announced) a special PhotoPass promotion also available to military personnel. From January 1 to December 19, 2017, active and retired U.S. military personnel who are eligible for the Military Salute offer can also purchase the Disney PhotoPass Collection for $49, a discount of 50% over the usual $99 price. The Disney PhotoPass Collection includes digital downloads of all available PhotoPass photos linked to your account, a voucher for a dining print package and a Disneyland Resort Gallery Disc with 350 high-resolution professional photos from around Disneyland Resort. We've recapped the 2017 Military Salute offer below, and you can find all of the detailed terms and conditions on our MousePad discussion forum. Disneyland tickets may be used January 1 through December 19, 2017, except that the tickets may not be used April 9–23, 2017. Active and retired U.S. military personnel can purchase Disney Military Promotional Tickets for themselves and up to five additional family members or friends. No more than six Disney Military Promotional Tickets may be purchased by any eligible member of the U.S. military (or spouse) pursuant to this offer. All tickets and options are nontransferable and must be used by December 19, 2017. Disney does not publish the actual discounted rates, and instead asks eligible U.S. military personnel to call (714) 520-7088 to check pricing, availability and to make reservations. In past years, the offer was generally 30 to 40 percent off, based on room category. Unlike the Walt Disney World version, the Disneyland offer allows the eligible service member to book up to two rooms, and allows spouses (with valid and proper ID) to qualify in the absence of the service member. From January 1, 2017 – December 19, 2017, active and retired U.S. military personnel who are eligible for the Military Salute offer can also purchase the Disney PhotoPass Collection for $49, a discount of 50% over the usual $99 price. The Disney PhotoPass Collection includes digital downloads of all available PhotoPass photos linked to your account, a voucher for a dining print package and a Disneyland Resort Gallery Disc with 350 high-resolution professional photos from around Disneyland Resort. Premier Annual Passport ($1,439) – valid at both Disneyland Resort and Florida's Walt Disney World Resort; includes parking and digital PhotoPass downloads. No blockout dates. Disney Signature Plus Pass ($1,049) – includes discounts, parking, and digital PhotoPass downloads. No blockout dates. Disney Signature Pass ($849) – includes discounts, parking, and digital PhotoPass downloads. Some blockout dates, including December holidays and other peak days. Disney Deluxe Pass ($599) – includes some discounts. Some blockout dates, including December holidays and other peak days. Southern California Annual Passport ($459) – includes some discounts. Many blockout dates, including Saturdays, December holidays and other peak days. Southern California Select Annual Passport ($329) – includes some discounts. This pass has the most blockout dates, including all weekends, December holidays and other peak days. Southern California CityPASS ($346/$314) – includes a 3-Day Disneyland Resort Park Hopper Bonus Ticket (including one early-entry day), a one-day admission to Sea World San Diego, and a one-day admission to LEGOLAND California. The CityPASS expires 14 days after first use at any location, and the first use must occur by December 31, 2017. Purchase CityPASS through the Disneyland website or on-site at the ticket booths of Disneyland Resort or the other theme parks included in the pass. You can also purchase directly from the CityPASS website, though a shipping charge may apply depending on how quickly you need the ticket. When you purchase the CityPASS, you have the option of adding a one-day admission to either San Diego Zoo or San Diego Safari Park for an extra $42/$34. This upgraded pass is only available for purchase directly from the CityPASS website. Add a 2nd day at LEGOLAND for $25. Purchase this upgrade at LEGOLAND on the day you use your CityPASS. Add LEGOLAND Water Park for $30 for ages 3+ and $5 for ages 2 and under. Purchase this upgrade at LEGOLAND on the day you use your CityPASS. Upgrade your Disneyland ticket to another ticket or annual passport of equal or greater value. For the current Southern California CityPASS, a credit of $295 for ages 10+ and $283 for ages 3-9 will be applied toward another ticket of equal or greater value. Purchase the upgrade at Disneyland before the end of your third visit. A special combo ticket available exclusively through MousePlanet travel partner Get Away Travel. The bundle includes either a 2-day or 3-day Disneyland Resort Park Hopper Ticket, plus a 2nd Day Free Universal Studios Hollywood Ticket. 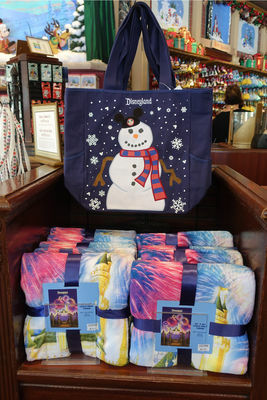 Disneyland Snowman Mickey Tote for $19.95 with a purchase of $25 or more. Disneyland Throw Blanket for $19.95 with a purchase of $40 or more. Customers can add a Snowman Mickey tote or Disneyland castle throw blanket to their qualifying purchase for $20. Photo by Adrienne Vincent-Phoenix. Landry's Select Club – members of the Landry's Select Club get priority seating at the Rainforest Cafe when available (which makes a huge difference on busy days). This club replaces the former Rainforest Cafe Safari Club, and runs on a point-based system that gives you a $25 gift certificate after you spend $250. Membership now costs $25, but comes with a $25 birthday reward. We recommend that you prepurchase your membership before your visit so you can take advantage of the priority seating benefit. ESPNZone MVP Club – membership in the MVP Club does not offer any discounts on food. However, once a member you can make an online reservation for your party up to three days in advance and will get a 25 percent increase in points purchased when playing games in the Sports Arena (and 40 bonus points at activation). You must register online and your membership card will then be mailed to you within two weeks. The card must then be activated at any ESPNZone by the person who signed up for the card and ID will be required (link). Disneyland Resort merchandise –...Disneyland has once again extended the additional 20 percent merchandise discount offered to Disney Signature Plus, Disney Signature, Disney Premier and Premium annual passholders, this time through December 31, 2017. All other passholders receive a 10 percent merchandise discount. Visit the Annual Passholder discount page for specific details and exclusions. Star Wars Imperial Meet-and-Greet at Disneyland – cardholders have access to a private character meet-and-greet photo opportunity in the Star Tours Launch Bay in Tomorrowland. Offered daily from 4:00 to 8:00 p.m. Darth Vader is once again the character featured at this location. Downtown Disney District dining and merchandise – 10 percent off at Ralph Brennan's Jazz Kitchen (maximum discount of $40, excludes alcohol), Wetzel's Pretzels, Ridemakerz, Alamo Rent a Car, and ESPN Zone. See "2017 Disney Military Promotional 3–Day Park Hopper Ticket" above. 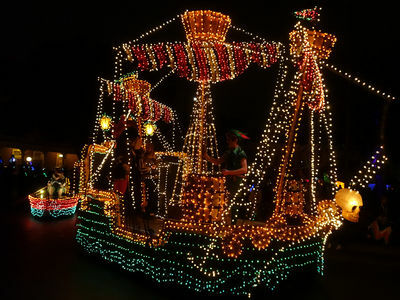 Contact Disney Travel at (714) 520-5050, book online through the Disneyland website, or call your favorite travel agent to inquire about these packages. 2017 – January 1, 2; February 18, 19; March 18, 25; April 1, 8, 9, 14, 15, 22, 29; May 6, 13, 20, 26, 27, 28; June 3, 10, 17, 24; July 1-4, 8, 15, 22, 29; August 5, 12, 19; September 2,l 3; November 10, 11, 23, 24, 25. The Seasons calendar is published on the Disneyland website for the next 8-11 months. Correction for the Refurbs. Grizzly River Run will be closed through March 22 according to the DL interactive map. Another change for the refurbs. After research on the Disneyland official calendar/map, it appears World of Color will be closed February 21 through March 5.